Well, Cookies never was subtle, and this time he used friends on FB to poke me in the eye and make me write another post. And yeah, he succeeded 0_o. So, couple weeks ago, we were entertaining in the Burrow, yeah since we moved in 2 years ago it was first time! Not counting my Dad, who came couple times for dinner ;-). I think it was 4th of July week or one week later and we invited our 3rd floor, sorry 4TH FLOOR neighbours for some food, beer and fun. This is the time we made the peanut butter chocolates 😉 oh yeah baby! Since Cookies was in the picnic mood (4th of July) we made baked wings and potato salad + the chocolates and of course beer, chippies and salty snacks etc. Everybody can make good wings… just don’t burn them 0_o. But good potato salad is different thing. It’s all about balance. The perfect combination of ingredients that don’t overwhelm the others… I think we managed 😉 The next day I took leftovers to work and it ROCKED!! Since I don’t like skin on the potatoes, peel them before you cook them. Boil potatoes in lightly salted water and set aside to cool. In the same time boil eggs hard, letting it cool as well. Dice bacon and fry until tasty scents are flying around and bacon is crispy - cool it as well. 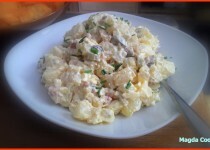 Cut potatoes and eggs into desired size, add bacon and chives. Dice pickles and mix in. In the bowl or cup mix thoroughly all the dressing ingredients. Pour over salad and chill for 2-3h. Of course it’s good already, but after chilling and the flavours biting at each other it will be just freaking spectacular! P.S. Cookies thoughts... Well I sure liked it. 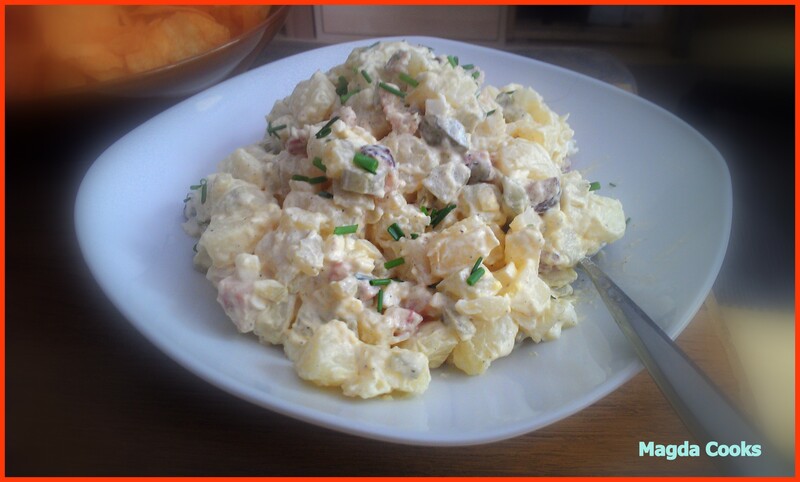 And Magda Cooks…the Potato Salad just right.